Cooperation between Ha Noi and France’s Toulouse city in preserving and promoting values of the Vietnamese capital city’s Old Quarter over the past two decades is highlighted at an exhibition that kicked off in Ha Noi on September 10. On display are photos and information about the collaboration, which is reflected through multiple joint projects. Addressing the event, Chairman of the Hoan Kiem District People’s Committee Duong Duc Tuan said the affiliation between Ha Noi and Toulouse has significantly contributed to economic, cultural and social development of the capital city, including Hoan Kiem district. The exhibition helps the two countries’ people understand more about efforts made by Ha Noi as well as the support of the French Government and Toulouse in protecting and upholding values of the Old Quarter. Toulouse city’s Vice Mayor Jean-Claude Dardelet appreciated contributions by Ha Noi people to the collaboration, saying Viet Nam’s image is always in the heart of French people. The exhibition will run through September 20. 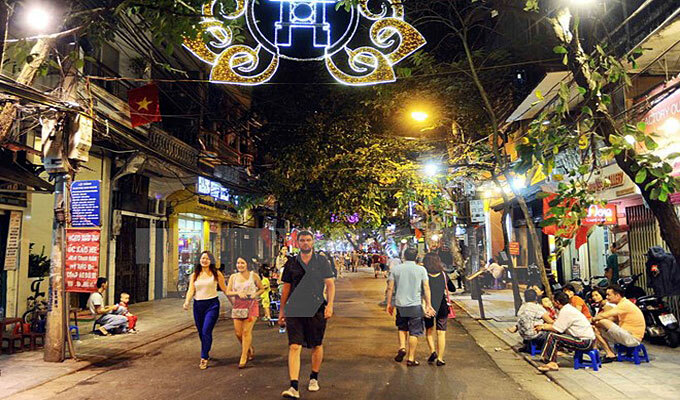 Hanoi has an old quarter of 36 streets, each being closely attached to a traditional trade that is clearly shown by its name, such as Hang Muoi (salt) Street selling salt, Hang Manh (curtain) Street selling bamboo curtains and Hang Bac (silver) Street selling silver jewellery. Some streets were named after a legend or special ana, such as Hang Chao (rice porridge) Street which was the place selling rice porridge to candidates who came to the capital to attend “Thi Hoi” (National Examination) and “Thi Dinh” (Court Examination) or Trang Tien Street near Hoan Kiem Lake where once existed a coin casting workshop of the Nguyen Dynasty (the 19 th century). Ha Noi is undergoing drastic changes daily and the old quarter with “Hang” streets are also affected by the process of development. Hotels, restaurants, coffee shops, etc., have mushroomed on these streets, so only a few streets with the traditional trades remain, such as Hang Bac, Hang Ma, Hang Manh, Hang Chieu, Hang Dong. The others have engaged in other trades, for example, Hang Than Street now sells Banh com (green rice flake cakes), teas and cigarettes in service of wedding ceremonies; Hang Vai Street sells bamboo products; Hang Chao sells mechanical and electric products to meet the demand of customers in the modern life. In addition, many new streets with new trades have been established in Ha Noi, such as Hai Ba Trung Street selling electronic products, Ly Nam De Street selling computers, Luong Van Can Street selling children toys, Hoang Hoa Tham Street selling ornamental trees and Dang Dung Street selling second-hand mobile telephones.